Nursing is a team profession. Important progress comes when great nurses work together, advancing the cause of better healthcare, fighting for greater healthcare equity, and seeing that patients are cared about as well as cared for. Our success as a school of nursing depends on more than just our dedicated and remarkable internal team. We do not and cannot stand alone if we are to lead. 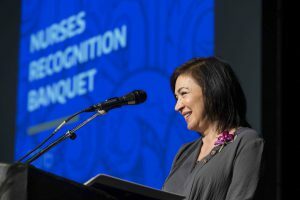 We are part of an intricate ecosystem in which chief nursing officers and those with whom they interact with provide many kinds of crucial input and support for our educational, public service and policy making efforts. Without their input, we would operate in a vacuum, speaking and listening to only ourselves and not benefiting from the knowledge and community connections of those who work outside academia. Chief nursing officers (CNOs) and other administrators are the bridges not built of steel, but of relationships between the School of Nursing and those we seek to serve. Many of those relationships begin with our students who become nurses, then managers, and eventually rise to be CNOs and other executives within the healthcare system. Some return to the School of Nursing for the advanced training and degrees that help them move upward professionally, and with each degree and each iteration, the relationships are strengthened. Unlike the Nobel Prize, the Honorary Assistant Dean position conveys neither fame nor fortune, but I hope it conveys the depth of our thanks and appreciation for all they do, as well as our hope that they will continue finding ways to be part of our ecosystem. We need and invite their presence and participation. We are proud to honor eight CNOs and administrators who have played a particularly significant role for us and for the community of which we are a part and name each of them an Honorary Assistant Dean. We are grateful of what they contributed to not only the School of Nursing, but also to our institutions, the community, and profession. Susan “Sam” Miller, ARNP, MN, RN; Chief Executive Officer, Careforce Inc. I invite you to learn more about these CNOs and administrators and the amazing work they do.